Once you accept that an ant colony is an organism-like entity, that it is a superorganism shaped by natural selection, the question of how to characterize the colony changes radically. Thinking of the colony as an organism in and of itself changes the focus from the individual workers, brood and queen to a focus on colony-level attributes. Neither the cells of an organism, nor the workers of a superorganism have a reproductive future save through helping the entity of which they are a part reproduce more of that entity. We tend to be blind to the superorganismal nature of ant colonies, perhaps in part because, unlike the cells of an organism, the ants are not physically attached to one another, but rush about performing their daily, colony-benefitting tasks. 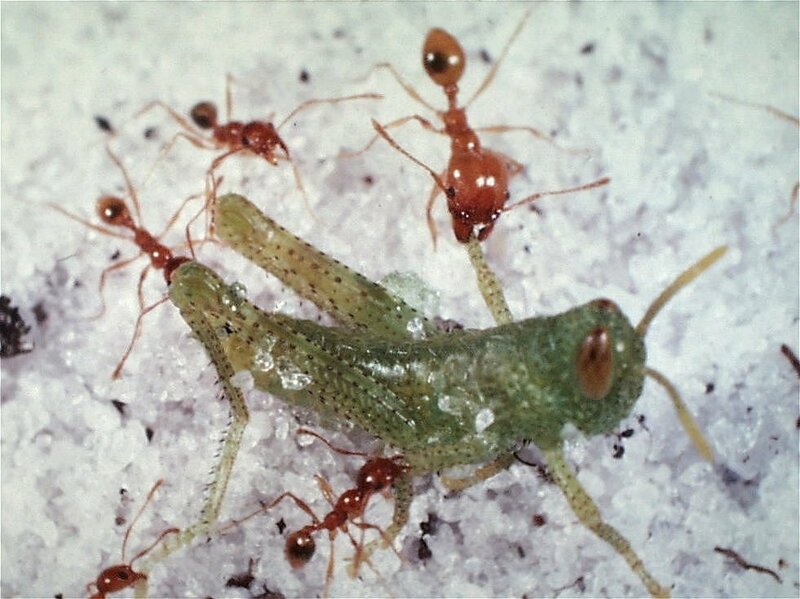 Natural selection hones the behaviour of individual ants, creating a more effective division of labor (function), which optimizes the survival, and reproduction of the superorganism (colony). To continue the parallels, both organisms and superorganisms are the outcome of development (embryogenesis and sociogenesis, respectively). The ant superorganism develops from a single queen (in most cases), has a growth rate, a lifespan and a maximum size. It builds a nest of a characteristic size and depth. Once large enough, it begins to reproduce through the emission of sexual ants on mating flights. Its workers have a characteristic size, number, turnover rate, and division of labor, along with many other details of form and function. The queen has a characteristic size, lifespan and reproductive rate. On top of all this, the superorganism goes through a seasonal cycle driven ultimately by the climate. All of these are the evolved characteristics that we need to measure in order to understand the superorganism and how it works. In order to determine colony-level traits, entire colonies must be collected and analyzed, together with their nest architecture (referred to as sociometry). As colonies grow and behave differently throughout the seasons, they must be collected at every stage of their lifetime development and in every significant season. But how do you capture an entire colony of ants and preserve its nest architecture at the same time? In a previous study (2010), we showed that paraffin wax casting of nests accomplished this goal- stopping entire ant colonies in their tracks and revealing their structure, much like the historic volcanic eruption did in the city of Pompeii. An example of a reconstructed P. morrisi nest cast. The method is simple. In our study, we melted paraffin wax in a coffee pot, then exposed the openings of the P. morrisi nest and poured molten wax into it until the nest was full. The wax flowed into every nook, cranny and chamber of the nest, capturing everything in place, leaving a hardened cast of a perfect, three-dimensional, quantitative record of the colony in space. Perhaps acting more like archaeologists than entomologists, we collected the cast by digging a pit next to it, and removing the cast from the side in 10 cm increments. Back in the lab, we melted these increments in an oven, filtered out the ants and other contents and cleaned them with solvent. The workers, queens, larvae, pupae and any ant guests were then counted, measured and otherwise studied. It took a lot of time, but we know of no better method for getting such complete information about a superorganism. In our current paper (Murdock and Tschinkel 2015) in this issue of Insectes Sociaux we used this method on a larger scale to determine the development and seasonality of colonies of the common ant, Pheidole morrisi in the flatwoods of northern Florida. Our goal was to determine how colony composition changes as colonies grow and go through the seasonal cycle. To capture this information, complete colonies of the full range of sizes were sampled on several dates that represented important phases in the annual cycle. The data were then analyzed on two interacting axes— colony size and season— to reveal P. morrisi‘s suite of evolved adaptations that make it what it is. With this example, we hope to stimulate similar studies on many ant species, eventually revealing how ant colonies of different lifestyles evolve in different habitats and latitudes. So what were the findings? Colonies contained up to 49,000 ants, much larger than previous estimates of maximum size. With respect to the seasonal pattern of brood production, colonies of all sizes did the same thing- they increased brood production at the same point in the season, emphasizing that these seasonal patterns are a basic adaptation. Colonies overwintered larvae but no pupae, so that broad cohorts within the colony were, in turn, larvae, pupae and very young workers. Consequently, workers in each age group lagged each other by approximately a season from winter until late summer. In the warmer months, there were two periods of worker larva production separated by early summer sexual production. Colonies as small as 3000 workers were able to produce sexuals. Surprisingly, larger colonies did not produce more sexuals than the smaller colonies, and the number was low even for very large colonies. This study is one of the few that links the nest architecture to the colony residing within, revealing a complex dance in which the ants and their brood move up and down during the annual cycle in nests whose maximum depth ranged from 0.5 to 2m. It seems likely that the vertical arrangement is in response to social, rather than physical factors such as temperature. Brood and callow workers almost always occur together, and brood care is the first duty of young workers. Generally, the colony moves into the deeper parts of the nest in the winter, and upward in the spring, coming to reside in the upper third or so of the nest. By late summer, downward movement has begun and by fall, part of the colony is deep in the nest and part higher. Interestingly, in the winter, major workers predominate in the bottom of the nest, with minors more evenly distributed, but in the spring and early summer, majors move up, suggesting a special function associated with the activities of that season. Because the major workers live longer, their proportion of total colony weight increased during the year, reaching almost 40% by fall, and this pattern was the same for colonies of all sizes. Temperatures ranged from 12 to 17o C in the winter to 23–33o C in late summer. Brood was mostly found in the warmest regions of the nest. 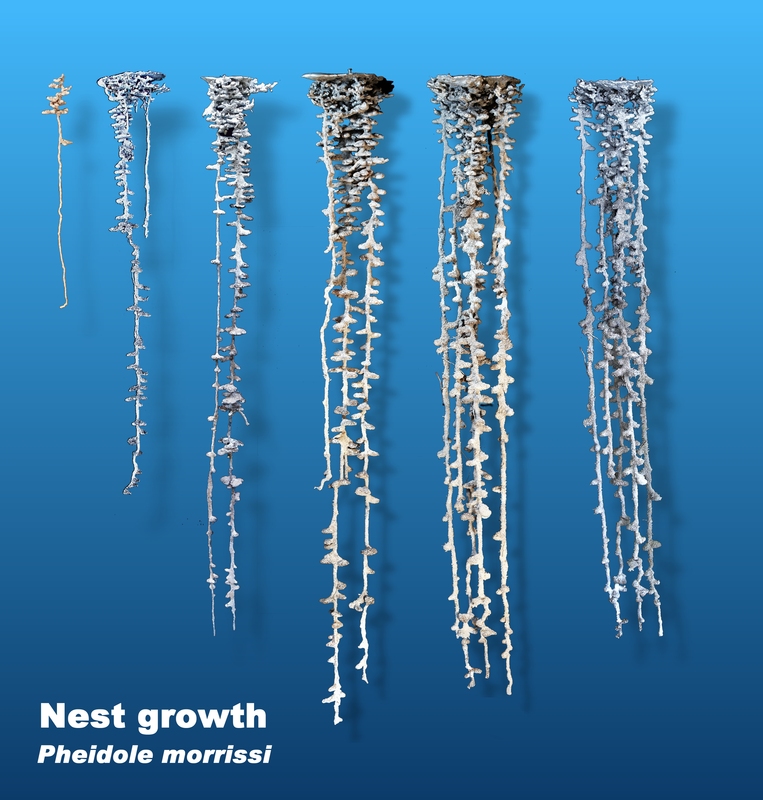 A figure illustrating P. morrisi nest growth from left to right. The nests were top-heavy in that volume decreased strongly with depth, so that no matter what the absolute nest size, about half of the available space was in the top 20% of the nest. However, the vertical distribution of the ants is not in response to the space available. The seasonal movement from deep to shallow and back down resulted in extreme seasonal changes in crowding at changing depths, but the importance of crowding in ants is not understood. Other, less obvious measures can also be derived from such data. Among the most important is the worker birth rate in relation to season and colony size. In ant colonies, workers are continually dying and being replaced, in other words, turned over (like cells in the body). The maximum colony size is thus achieved when worker birth rate equals worker death rate. A crude estimate of birth rate can be made from the number of pupae. For example, if a colony census shows 1000 pupae, and the pupal period lasts 10 days, then an average of 100 new workers will be born per day. Given additional information, such data can produce seasonal and size-related estimates of colony growth rates. This study confirms that a sociometric/sociogenic study based on wax casting is very doable, and can efficiently reveal many features of the life and seasonal cycle of an ant species. Because the colony is the counterpart of the unitary organism, the resulting description of the species P. morrisi tells us who this ant really is and how it is distinguished from others.